Welcome to the Busch School of Business. Our school differs from others in that it has a very clear mission, and that mission is to take Catholic social doctrine and help the business world understand how to implement it in a way that benefits the business organizations themselves, the people they employ, and society as a whole. The Catholic Church has developed a rich and deeply rooted body of thought about business and social justice over more than 100 years. Recently, Pope Francis has reached out to business people asking us to find new ways to create jobs and encourage entrepreneurship. Calling business a "noble vocation," the Pope has challenged business professionals to work to build organizations and economies that are sustainable, just, and beneficial to all. The principles of Catholic social doctrine are not opposed to capitalism or a free-market economy. On the contrary, they are practical, helpful, visionary guidelines about how to use resources and build organizations that will enable individuals and societies to flourish within a free economy. There are four basic principles. The dignity of the human person. This is the foundational principle of Catholic social doctrine, and it applies to all persons in every circumstance and every stage of life. Our long term goal is to have CEOs recognize that the person is the purpose of a business, and not the dollar. Focus on the person, and the dollars will follow. Subsidiarity. This means pushing decision making down as far as possible in any organization so that people can expand their dignity by making decisions that they are properly supposed to be making. Common good. This principle reminds us to see ourselves as stewards of the wealth that we create, and not its owners. Solidarity. I like to define this idea as "all for all." In the business world, what that might mean is that we pay attention to how can we work with all the stakeholders of a business — suppliers, customers, shareholders, employees, and the community itself — and make sure that what we're doing is really trying to help them all flourish. We integrate these principles into all aspects of business — accounting, finance, management, marketing, and so forth — in a way that does not diminish academic and professional excellence, but rather lifts the whole enterprise to a higher level. It is an innovative, entrepreneurial, and rigorous approach to teaching business. Our students and graduates are living proof that it works, inspiring achievement both in the classroom and in the workplace. 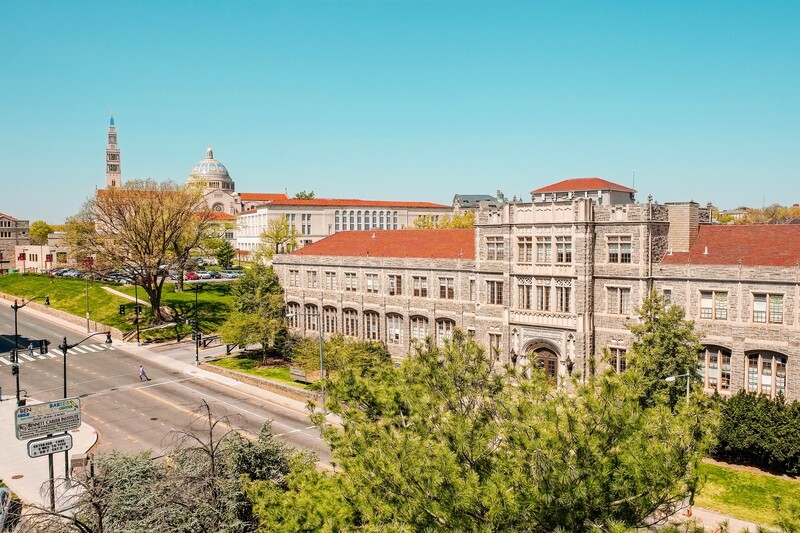 It is a great benefit for our students to be here in Washington, D.C. Internships, exposure to top-level business leaders, and the job opportunities that abound in this area all give the Busch School of Business an added competitive advantage. The students, faculty, and staff of the Busch School of Business are striving to grow as persons of integrity and virtue as we apply professional knowledge and skills to the goal of transforming the world of business into a force for good. I invite you to become part of this exciting and inspiring enterprise.